"It's a great relief to see Pop happy in his new home, Regents Garden. Such a weight off our shoulders to see him so contented. Now he says when it's convenient for us to visit!! After all, he has a social life now." "Beautiful surroundings, good food and the opportunity to meet new people. Grandma has a new lease on life." "Deteriorating health compelled us into placing a previously independent and motivated dad in care. We were daunted at the prospect until we found Regents Garden." "How wonderful to have been included in all the festivities celebrated at the Facility. It was a pleasure to be able to relax seeing Mum so peacefully contented enjoying herself." 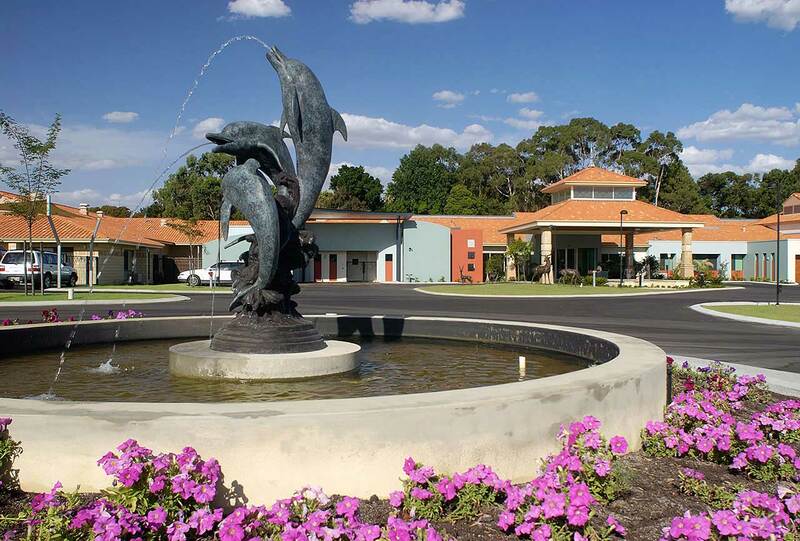 "We think Regents Garden Joondalup is the best Nursing Home for facilities and staff. The staff were amazing and we could not have wanted for a better place for Mum for the last 2 1/2 years. Thank you." "Throughout the years Mum lived in Regents Garden we were overwhelmed by the kindness and care shown not only to her but to all the family." "Sincere thanks for all the care and support given to my dad. I cannot sing your praises highly enough." "It's a great comfort to have Dad in beautiful surroundings, being supported by genuinely caring staff." "We would have no hesitation in recommending Regents Garden to any family needing care for their loved ones." "Thank you for the love and support extended not only to our parents but to our whole family." "We had a win when we found Regents Garden for our grandmother. You turned what was a very difficult decision into the right one for us. Professionalism together with warmth and understanding of the transition that this formidably independent dear lady had to undergo. Thank you all." "Mum was always well groomed but looking back she had lost interest in her appearance. Now she doesn't leave her room without combing her hair and applying lipstick. It's wonderful to have Mum back to her old self." "Senior staff provide advocacy and ensure Mum has nothing but the highest level of nursing care." "Mum was truly happy and after an outing with the family we would say "OK Mum, do you want to go home now?" and her reply with a big smile was always "Yes it is time now." "We as a family appreciate your beautiful care for our mum and feel greatly indebted to you." "We could not have chosen a better place for Dad. All the staff are a credit to the various professions they represent." "The Occupational Therapy activities are always fun to join in. I look forward to the "Theme Day" lunches. The themed food and decorations make it feel very special.."
"I just want to say thanks for taking such good care of my nanna. She means so much to me and she always tells me the lovely things the staff all say and do for her. It means the world to me that she is somewhere with such kind, friendly, thoughtful and fun staff. You are all doing an amazing job!" "It is a very beautiful place and very comfortable. The meals are excellent, as good as any restaurant. There is no washing to do which is wonderful, it all just arrives back in my room!" "Regents Garden Care Facility proved a godsend for me as it offered wonderful care in a friendly, relaxed environment." "I am so glad to be able to be at Regents Garden. Staffs are so obliging and helpful all the time. Lovely and clean. Plenty of activities to do to pass the time. Food is always well presented. Kitchen staffs are great as well as the carers that shower me take time with me in getting me up all the time. I feel safe that they do it with care. I know they have a lot of people to shower in the morning." "I'm so pleased to be able to call Regents Garden my permanent home. All the staff can't do enough to cater to your wishes and well being. I know I've chosen the best there is on offer, a big thank you." "The staffs are very kind and helpful. The environment is both attractive and peaceful. I enjoy a laugh with the happy staff." "I am very happy here at Regents Garden. The staff are wonderful and all very caring of our needs. Nothing is too much trouble. It's a pleasure to call this my home." "The staff always greeted the family with a smile. They were always so kind and helpful and the care and attention received was always good. She loved to join in the many activities that are provided here." "We have learnt a lot and appreciate the opportunity to learn in such a nice facility." "Her first step into her new "home" was the beginning of almost seven years of contentment and happiness. It meant so very much to us and our family that she experienced so much happiness and contentment in the last phase of her life. She felt secure and happy, and was clearly loved by all of the staff." "We cannot thank you enough for the years of loving care all the Regents Staff afforded our relative. We are also very much aware that you have ensured that Regents Garden was administered professionally, whilst always having a friendly and caring approach to any concern we brought to you. That has meant very much to us." "My grandmother is in Regents Garden and I am always impressed with the care shown and the friendliness of all the staff. The other day when I visited I was walking behind a staff member (unbeknownst to her) when she passed a woman who I always see who really seems to have no idea what is going on anymore and just wanders around, and the staff member just slowed as she walked passed her and kindly squeezed her hand and gave it a bit of a rub. It was a small thing but I was really touched at the time. I thought it was symbolic of the care I always see from staff and it is incredibly reassuring knowing that is the quality of staff looking after my grandmother." "The staff are lovely and I feel that I am in safe hands." "Thank you for all the loving cares all the staff give to our Mum on a daily basis." "Such a lovely place to visit and I know my friend is being cared for as she always looks so well." "We are all deeply appreciative of how happy you made our Mum for her last few months. She was content at the end of her life and extremely appreciative of all the love and care, hugs and cuddles and time you people were generous enough to give her there. I was moved by the happy environment you managed to provide in the face of such suffering and shortcomings experienced by residents. My mother was treated with respect and patience." "Just a brief note of thanks for all of your wonderful help and kindness given to our Mum. Marion lived alone for some years and I am quite sure that if she had not been admitted to Regents Garden then she would have passed on many years before last Wednesday. Marion truly loved living at Regents Garden and we saw her improve greatly in health and general wellbeing. I can honestly say that all of the staff and management of Regents Garden showed Mum genuine care, friendship and love." "I have found all staff to be nothing other than professional, warm, genuine and approachable." "My mother's circumstances have seen her experience great trauma so when I see Mum treated with dignity, warmth and compassion, my heart aches with joy." "The staff demonstrates the ethos of human compassion and caring in every day operations." "Being a pensioner I never thought my mother would be fortunate enough to not only receive the very best of nursing and emotional care but to enjoy a single room in a beautiful environment." "Mum resisted placing my grandmother in residential care until the day she viewed Regents Garden, which offered fantastic service in a beautiful environment and was affordable. We are all so happy after only a few short weeks in the Facility. Grandma has made new friends, is extremely happy and settled." "The family used to worry about Mum living independently. We would find meals in the fridge uneaten. Since coming to Regents Garden, our Mum goes to the dining room and enjoys her meals and the opportunity to socialise." "The RN on duty during a brief time my brother from Germany was visiting our mother in Regents Garden offered her professional guidance in an appropriate and compassionate manner. Upon his return to Germany, he has remained indebted to the kindness and professional direction over and beyond the requirements of her role given at a very emotional and distressing time." "We have been blessed to have Mum welcomed into Regents Garden and I am constantly overwhelmed by the goodness and professionalism within the Facility." "The staff were kind, professional and treated Dad with dignity. At all times he was treated as an individual." "We were overjoyed when we were offered a place at Regents Garden and in the years to come it was often said "We might not win Lotto (not for lack of trying mind you!) but it doesn't matter, we've got Regents Garden." "Very happy with caring staff and lovely surroundings. We are sure that Eva is in the best of hands." "High time I thanked the management and staff for the excellent treatment I have received since I've moved to Regents Garden. I am very happy to be so well cared for." "Thank you all for the kindness and care you have shown Tony and myself over the last few years. Tony is back with you again and the relief is just a joy. I never worry at all when he is with you." "Words cannot adequately express our appreciation for the love and support you have shown to us, particularly after the passing of Ted. We are deeply grateful." "Thank you for all your help and sharing your knowledge." "Thank you to all the staff here at Regents Garden. We will all be better nurses because of you." "Thank you for making this next stage in Ian and my lives as smooth and hassle-free as humanely possible. As you know, it has been a very emotional and soul-searching time, but your kindness, understanding and encouragement has made it work. Thank you all very much." "There are really wonderful and caring staff and the management are exceptionally approachable and helpful." "What a pleasure it is to drive into Regents Garden and see the beautiful gardens in all of the six years we have been coming here. Compliments to the gardeners - great job." "Please compliment the house-keeping staff, she is always so pleasant and caring." "I have been speaking to the serving staff whose serving manners at the table are first class." "Please pass on my sincere thanks to admission team for your kindness and very attentive manner for accepting my father into his new home at Regents Garden. I was made welcome at my very first phone call enquiry and immediately felt this is where my Dad will be comfortable. As a family we are very grateful and look forward to your continued support for Dad." "I would like to thank the management for installing the "Skype" video communication system which I requested for the residents at Joondalup. I believe it could have positive benefits for many residents and commend for the prompt implementation." "Congratulations to our physios at Lake Joondalup. Both are very caring, do a great job with a sense of humour and safety is their number one priority." "For the first time last week I met Stuart, he was feeding Mum. I couldn't believe how good he was - making her eat something and talking to her like she was special. I could tell he really has his heart in his job and just wanted to tell someone what a great job he is doing. Thank you Stuart, great work." "Can't fault anything, from the care staff to the environment. It is wonderful." "Can't wait until I'm old enough to move in!" "Everyone is so friendly; nothing is too much trouble." "The staff are very considerate and caring." "The staff are wonderful and the meals are great; this is my home." "Homely, Happy; all the staff are friendly." "I couldn't be happier. I have everything I need." "You don't have to cook and wash up!" "I think we all felt swept along with the speed of things but it was the fact that Regents Garden felt so right that we were comfortable with allowing it to happen so quickly. It was very important to us that we felt part of the process and have come home knowing that our parents are in good hands and we can stop worrying on a daily basis." "At Regents Garden nothing is too much trouble. From the outstanding care and concern from the cleaning and kitchen staff to the nursing staff and management of angels; impeccable duty of care, kindness and concern at all times. The surroundings are beautiful but it is Regents Garden staff of angels that truly makes it heaven on earth!" "You are a wonderful team; professional, caring and sensitive. The facility is fabulous too. We really enjoyed visiting Mum there and seeing your smiling faces." "The physical environment of Regents Garden is gorgeous, and it would be nothing without such a caring and compassionate team of people doing such a wonderful job of supporting our elders who are unable to care for themselves." "I was impressed from the first moment that I bought Mum into the facility, with her room warmed to greet her, the chandelier sparkling and the amazingly friendly and helpful people supporting me to settle her in. Mum was very grateful to all who cared for her and was also touched when they came to say goodbye and wish her well." "The dedication and quality of care in this difficult time was outstanding with staff excelling themselves. Knowing that my Dad was in a safe and secure environment with the medical and personal care he received, gave us peace of mind." "We, as a family, would like to share our gratitude and thanks for the welcoming and care for Mum. We expected the transition was going to be a challenge. However, the focus and quick reaction of your staff is nothing short of marvellous and a credit to you all." "Thank you very much for the wonderful care and attention you provided to our mother. Our entire family appreciates the efforts you made to help her feel comfortable and "at home" at Regents Garden." "I can't say enough about all of you. It's always lovely to come back and see you. I hope there will always be a place for me here even if it is only for respite until it's time to come for good." "Thanks for the kindness that you showed to my mother over the last years of her life. Although she found it difficult to show her appreciation, she always spoke extremely well of Regents Garden and was very happy there. Certainly, we were very happy that she was there and being so well looked after. I will miss our visits to your wonderful facility at the weekends; it was always a pleasure." "Thank you for all the good times and making me feel so appreciated. It has been a pleasure working with you all. I have really enjoyed my time here." "Thank you to all the staff that supported us in so many ways. For your hugs. For your kind words. For your tears. For the beds. For the food. For being there. It helped us so much. Thank you." "Thank you from the bottom of our hearts. We will always sing your praises." "As a family we value being informed of any incidents concerning Dad. It is a comfort to be able to respond with support for Dad and the staff." "Staff are always happy and greet us warmly when we visit Mum." "There is a spring back in her step these days. We suspect now that Mum was really lonely living independently." "What a surprise. Professional staff in beautiful surroundings at an affordable price. We expected it to be financially out of reach for our mum but that didn't prove to be so." "You are all doing an excellent job caring for the elderly." "The benefit of living in a gated community gives us the security we were after. With the future development of amenities an added bonus. Proximity to all necessary services with good public transport links makes this an ideal location. Having new neighbours who are fast becoming friends with like-minded pursuits only adds to the relaxed environment." "Five years ago we moved into Regents Garden retirement village in preparation for our retirement. We were looking for security, peace, happiness, and privacy. Like most moves there was some trepidation and ambivalence, however on arrival that was very soon all behind us. The beautiful well-appointed bungalows set in the spacious grounds and gardens, for us is a dream come true. Our five years at Regents Garden have been very happy and from our own personal experience I give Regents Garden our highest recommendation. To all contemplating retirement in the near future do not make final decision until you have visited Regents Garden. We wouldn’t be anywhere else." "Regents Garden has surpassed our expectations. The facilities and activities available together with the friends we have made make for a wonderful lifestyle. The best decision we could have made." "My husband and I moved into Regents Garden 4 years ago and when he became too ill to stay at home, he moved to the Aged Care facility located within the village enabling me to spend time with him. I love the retirement living lifestyle here and the amenities provided. I would not want to live anywhere else." "We always think we’re taking a risk when one moves out of the homes we all loved. For us, it was the right move. It’s a place of tranquil walks. One can swim, spa or work out in the gym, watch movies in the theatre and join the many activities available. Cards, Whist, Game Nights including, Table Tennis or a quiet board game, Lawn Bowls, Indoor bowls and Art classes, Etc. Above all, the feeling on safety like what we had years ago. Living in a village where there’s always some one who cares and will help. Regents Garden has become home to all of us in the village." "Deciding to sell our home and move to Regents Garden was difficult, however it was the best decision we ever made. Everything we need to make a wonderful lifestyle is provided. We love it!"